This cheesy rice dish will trick the cheese lover in your household with the fact that there isn’t that much cheese. Simply pick up a head every time you go to the store because it will keep fairly well. I found organic cauliflower that was exactly the same price as the regular one (crazy). 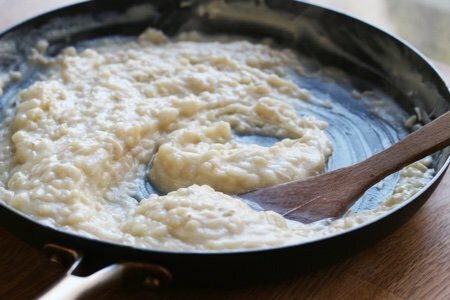 The trick here is to puree the cauliflower so it turns into a “cream sauce”. My children (who think that they hate brown rice) didn’t notice that the rice was brown because it was swimming in the cauliflower. 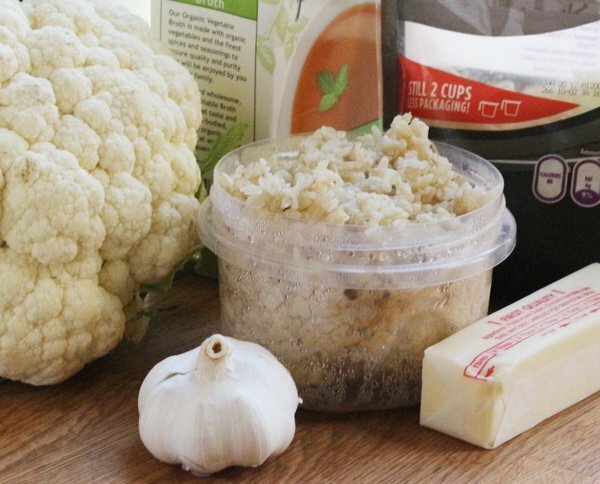 Cook the cauliflower in vegetable stock to infuse it with some flavor. 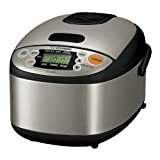 I made my rice the day before in a Zojirushi rice cooker (see below). It takes forever in this rice cooker to cook but it always comes out perfectly. I received this cooker years ago for review – and I love it so much that I am thinking of investing in the company. Seriously, if it ever breaks –I am buying another one. I don’t care if it costs $160 because it makes PERFECT rice and I don’t have to think about it. My son, macaroni and cheese lover extraordinaire, loved this and almost ate all of it himself. He did not know there was cauliflower involved – he thought it was all cheese. Of course, it is easier to fool a 10 year old than an adult but you can try! Serve this as a side to fish or whatever you like to pair with mashed potatoes or macaroni and cheese. My husband made lamb chops and layered them over this (like it was mashed potatoes) and it was divine. 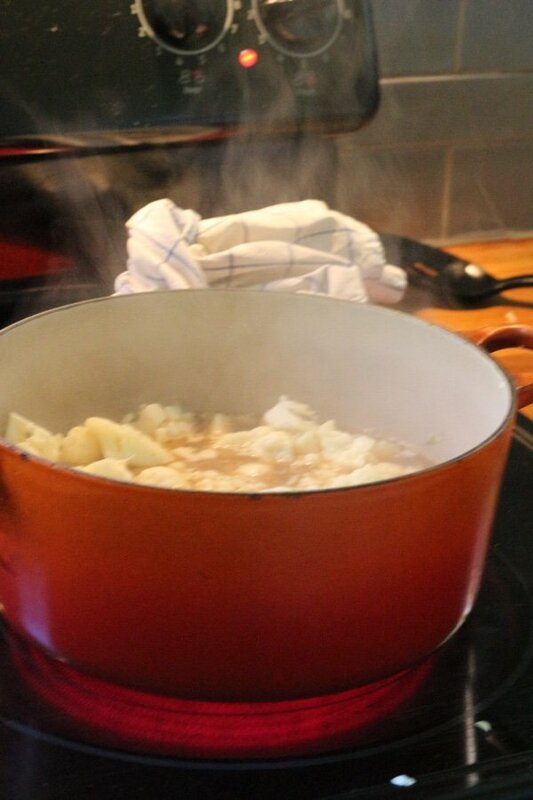 Put the cauliflower and vegetable broth in a large pot and heat to high. Cook for about 8 minutes until the cauliflower is tender. Put cauliflower and 1/3 cup vegetable broth in a high power blender and puree. In a large saucepan, heat butter. Add garlic and cook until almost brown. 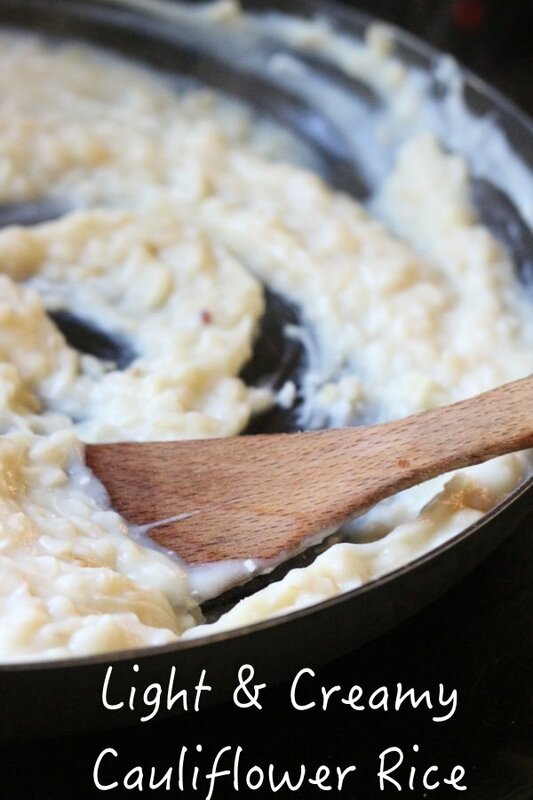 Add brown rice and toast for one minute. Add cauliflower, cheese, and salt and pepper to taste. Serve immediately. Can be stored for 3 days in a tightly sealed container. This looks amazing!!! Would it work to use other types of cheese (like cheddar or pepper jack)? Thanks!! This sounds awesome. I'm interested too, to know if other cheeses would work. I could go for some today over a small pasta. While this recipe looks delicious, please check where the rice is grown. Brown rice has typically the most arsenic in it than white rice. I use Basmati rice which is the lowest and most of which has no arsenic. This is really important regarding feeding it to children. Here is an FDA link that will give you a chart of inorganic rices and amount typically found in various rices. You will need to scroll down about a quarter of the way of the document to see the charts. @Meagan and @BarbL - any cheese will work. It is an empty palette waiting for your favorite flavors - cut down on the garlic and add chilis perhaps? I made this last night and have to be honest -- it was awful. The consistency was like wallpaper paste and it was very bland. I love rice and cauliflower, but this didn't do it for me. @cheryl - thank you for coming back and sharing your review. I am so sorry it didn't work for you. I found that it needed salt and to be paired with something else (like a lamb chop) to work for me. I always feel terrible when someone tries one of my recipes and hates it. ACK! I made this and followed the directions carefully. Mine didn't look anything like in the photo...its was quite thick - more like mashed potatoes. It wasn't bad tasting, but the appearance was nothing impressive. I think the problem might be that stirring the rice into the cauliflower for too long turned it all to mush...next time instead of brown rice, I may try tossing the cauliflower with cooked long grain rice - which tends to be firmer and might hold up better to the mixing...not sure...but am willing to try it again. I thought it was one cup of this mixture for the 5 SP's. Might be wrong about that...but couldn't be too far off. @Sue - i ran the numbers and 1 cup is 5 SP - thank you! Please make sure you add salt and pepper to this. That might help!